Grant Dalton has told NZ Media that the team will not compete in the next Volvo Ocean Race. While race organizers have said that stopovers will not necessarily be tied to competing teams, the news probably means that Auckland will not be a stopover for the next edition of the round the world race. The Volvo Ocean Race had been seen as a platform to deliver value to the Emirates, the team’s long time sponsor in the absence of a recognizable America’s Cup campaign. According to the most recent news, the Volvo race has been ditched for two reasons: it was proving too expensive and was superfluous to the team’s needs. 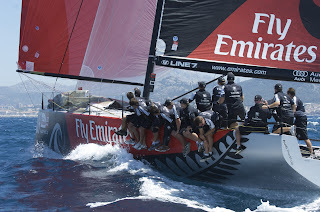 Emirates Team NZ are committed to a TP52 campaign in the Audi Med Cup and the new Louis Vuitton Trophy. Dalton hopes that with the DOG Match now happening in Valencia, the future of Emirates Team NZ in the America’s Cup will be more certain, once a winner is determined. Notwithstanding more court cases and the lack of wind in Spain, Grant Dalton is hoping to move on. He said: ‘I don’t for a minute discount the possibility of more delays but there’s now, for the first time in a long time, light at the end of the tunnel. ‘There’s a future for the team beckoning within days really. we are still here’ and ‘ready to race again’ once ‘there’s certainty in the future of the event’. ‘Above all else that is what we want, certainty. The best result for us is for the winner [of the deed-of-gift match] to announce a Challenger of Record and say the defender will enter into dialogue with the challengers. That’s about the best result we can hope for.’ ‘My focus needs to now turn to raising money and getting the team back together again. My heart is still in a Volvo but it would have been a massive distraction and the board felt we needed to change course.